And here we are, the last few fights from the Friday Night Fights. That means this is most likely my last Friday Night Fights article although I still might refer to them in the future. These might not all have won or even gotten a vote but it is my favorites of the entries I made to Friday Night Fights. I’m going to miss this event. It helped me find some of the sites I enjoy and enjoyed (some sites are no longer updated if they’re even up) and helped me connect with others in the blogging world. But at the end only three of us were left and it was all Spacebooger was posting on his site. He even stopped making the titular comic, but FNF continued on. Now it only lives on in our hearts. The final themes of the Friday Night Fights include “Dog Days”, a summer themed tournament, Roundhouse, which didn’t need a roundhouse anything until the Prize Fight, SMACK, another tournament only themed for the Prize Fight (that I can work with) that would also be the last Friday Night Fight tournament. Let’s relive the last of the memories. Note the symbolism of John-Paul cutting the Bat Symbol. No joke, that’s my critical perspective coming in. This one I thought would be my only entry in the tournament due to how poorly I know every fight in my collection. (Remember, a lot of these comics I own I haven’t read since I bought them, which is one of the reasons I’m doing “Yesterday’s” Comic.) Then Fred informed me that my interpretation of the rules was too strict and that this fight, that had been hiding in my drafts and even accidentally deleted (hence the url) qualified. This one was leftover from “Karate Kick” because I forgot no actual kick happens, but it’s a good fight, with Bruce having to psychologically take the mantle of Batman from Jean Paul Valley. It was around this time that I was slogging through Seduction Of The Innocent, a Chapter By Chapter special that will probably haunt me for as long as I do this site. I needed something fun, and here was a fight where the enemy was missiles and showcased the JLA version of the Justice League at its best. Too bad during this tournament I didn’t break out my best fights. By this point I was using fights in one of the comics I picked up that week and they weren’t the top of the line battles. These are the only entries that really stood out as amazing fights. The others were good, but not up to “best” quality. 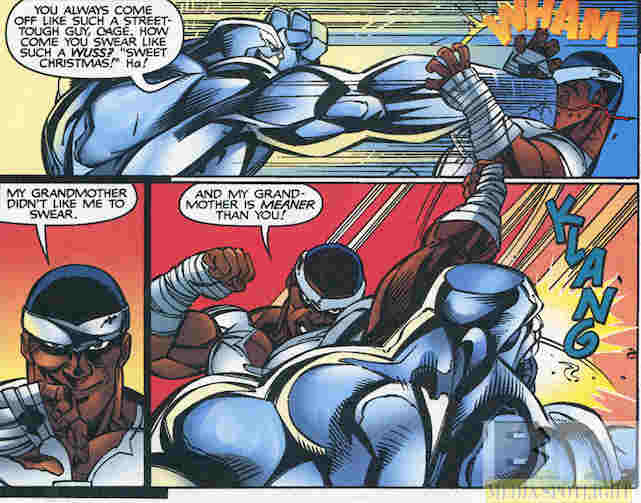 Luke Cage not using swears is actual canon, not the usual comic censoring for the Comics Code. More writers need to remember this when writing Luke Cage. I usually avoided the fights ending in death but frankly this guy had it coming. This was Songbird’s big moment, where she gained her confidence and showed what she can really do. Unfortunately this was also the beginning to her slide into being a real b#$%# but as we’ve seen she got better. Now she has confidence and I don’t want to hit her with a truck. Wins all around. Except for the Elements Of Doom of course. This makes up for the other fight. It’s more fun to see the Phantom break a villain than kill him. Well, Jazz versus the Predacons anyway. I like taking pop shots at the fake animal rights group though. Leave it to the Black Widow to turn a dance floor into a battlefield and have it feel like the same thing. I think we all want to see Harley Quinn give Joker what he deserves for how he treats her. Sadly it wouldn’t last and they’d end up together again because the girl has problems. Iron Man versus a giant robot? Of course I’m in! I’d been waiting on this fight for the right theme but it never came up. Since I was probably the only guy in the history of Friday Night Fights, from the original Bahlactus days to the end of Spacebooger’s run, to use minicomics I had to finally break this out for the last ever FNF. It’s one of my favorite He-Man moments, as he shows the power of patriotism. He’s just patriotic for a whole planet is all. Sadly we may never know who won this fight since his server updated and ruined all the polls. But I think the real winners were the audience and the bloggers who got to have fun with comic fights, from superheroes to fantasy to crime dramas to sci-fi to even comedy. Everything was fodder for Friday Night Fights. A good fight is harder than you think to make stand out and throughout the years myself and my fellow Friday Night Fighters found some of the best in four-color and sometimes black and white glory. I’m going to miss this event. Fridays should now be open for new articles but I do want to take the chance to do one more Friday series before then because I don’t want to save this next idea for a monthly offering. You’ll find out what it is on Sunday during Jake & Leon but here’s a hint. I’ve done it before with Batman and now I’m taking the idea where no one has gone before…except for the guys that came before it. Posted by ShadowWing Tronix on July 20, 2018 in best of FNF and tagged Batman, Black Widow (Natasha Romanoff), Friday Night Fights, Harley Quinn, He-Man, Iron Man, Jazz, JLA, Luke Cage, Songbird, The Phantom, Transformers.